Ordinary Men by Christopher Browning. In this vein, I'd like to plug the book *Ordinary Men *, which examines how people went from being normal middle class people with normal jobs, from bakers to bankers, to routinely killing thousands of people. Because they were too old or out of shape for combat, hundreds of these men were conscripted into Reserve Police Battalion 101. The first order to kill came while they were in the Polish town of Jozefow. The battalion's commander was choking back tears as he gave the order to his men. He even gave everyone the opportunity to step down if they didn't feel they could carry out the order. Only 12 of the hundreds of men stepped down. 1500 Jews were executed before a mass grave that day. Some didn't die immediately and were instead suffocated by the bodies that fell on them. That battalion of "ordinary men" went on to kill 38,000 men, women, and children; and sent another 45,000 to camps to be executed. The author examines how they went from average citizens to mass murderers. Much of it comes from their own testimony at their trials. Some is speculation based on current psychology. Both make you really think. I highly recommend everyone read it, as it seems more relevant today than at any time since. 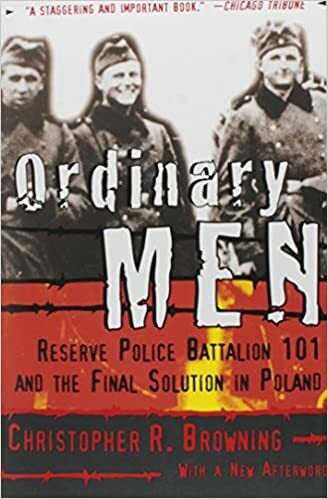 In Christopher Browning's Ordinary Men: Reserve Police Battalion 101 and the Final Solution in Poland he depicts the response of Police Battalion 101 to participating in the genocide of European Jews using testimony from their post-war trials. Nearly every member, including the Battalion commander, showed signs of regret or PTSD, according to Browning. You "feel like"? That isn't a very strong argument. Have any evidence to back up your opinions? I have some to back up mine. This book is a seminal work that proves just the things you are saying to be very wrong. Also, many people who murdered innocents during the Holocaust weren't members of the Nazi party and didn't know that they would be ordered to kill helpless people. If you can make it through that book (it's a great read but very emotionally challenging) you will understand what I'm saying. > The 707th Infantry Division of the Wehrmacht put this principle into practice during an "anti-partisan" sweep that saw the division shoot 10,431 people out of the 19,940 it had detained during the sweep while suffering only two dead and five wounded in the process. > At Mirgorod, the 62nd Infantry Division executed "the entire Jewish population (168 people) for associating with partisans". At Novomoskovsk, the 444th Security Division reported that they had killed "305 bandits, 6 women with rifles (Flintenweiber), 39 prisoners-of-war and 136 Jews". In revenge for a partisan attack that had killed one German soldier, the Ersatz-Brigade 202 "as an act of retaliation shot 20 Jews from the villages of Bobosjanka and Gornostajewka and burnt down 5 Jew-houses". Even more extreme was the case in Serbia, where the majority of the Jews there were murdered by the Wehrmacht, not the SS. At Šabac, "Central European Jewish refugees, mostly Austrians, were shot by troops of predominantly Austrian origin in retaliation for casualties inflicted by Serbian partisans on the German Army". The orders issued by Field Marshal Wilhelm Keitel in September 1941 called for the German Army to shoot 100 Serbs for every German soldier killed by the Serb guerrillas and did not call for Jews to be singled out. But because of rampant anti-Semitism in the German officer corps, it was more or less automatically assumed that the Serbian Jewish community were behind all of the partisan attacks, hence the targeting of Jews in the mass shootings carried out in retaliation for guerilla attacks. The German historian Jürgen Förster, a leading expert on the subject of Wehrmacht war crimes, argued that the Wehrmacht played a key role in the Holocaust and it is wrong to ascribe the Shoah as solely the work of the SS while the Wehrmacht were a more or less passive and disapproving bystander.